The PLUTONS project is a NSF funded collaborative study including researchers from Cornell University, University of Alaska Fairbanks, Montana State University, Bristol University, UC Santa Cruz, Oregon State University, and the University of Alberta. 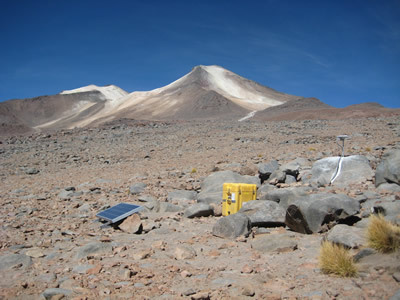 The project involves the geophysical and geochemical analysis of areas in Chile and Bolivia that are experiencing mid-crustal magmatic intrusion. Geophysical data will include those gathered from InSAR, seismic, and GPS surveys over the course of the next five years. On this particular April field trip, an array of 14 broadband seismometers and three permanent GPS stations were installed on Uturuncu volcano in south west Bolivia. The central GPS station is located in the small town of Catena, no more than 10 kilometers from the mountain. The eastern most site is situated at 17,000 feet, adjacent to the summit of the volcano. The western site is at a distance of 60 kilometers from the mountain along the shores of Laguna Colorada, a large salt flat and wildlife habitat, comprising part of the Bolivian National Park system. Trips will be made to give maintenance to and download data from the seismometers every six months in the future. There is currently no telemetry on the GPS stations but UNAVCO will again provide field support in October of 2010 to install satellite communications for the three sites. Facility support will also be required for a GPS campaign survey that will likely occur during the last two years of the project. Each site includes a basic, single mast mount antenna monument, a small enclosure for batteries and a Trimble NetRS receiver, and one solar panel mounted to the ground. 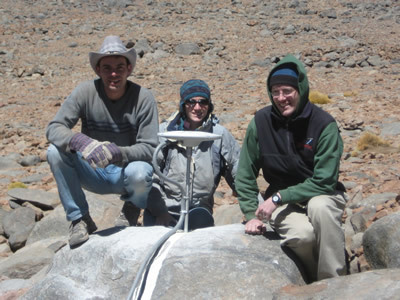 Figure 1 - Graduate students Brendan Christensen and Anna Bellesiles (far left and center, respectively), from the University of Alaska, pose with PI Matthew Pritchard of Cornell at the summit GPS site. Figure 2 - The summit GPS site on a clear day. Often mistaken for snow, the white material on the summit of the mountain is in fact geo-thermally altered rock. 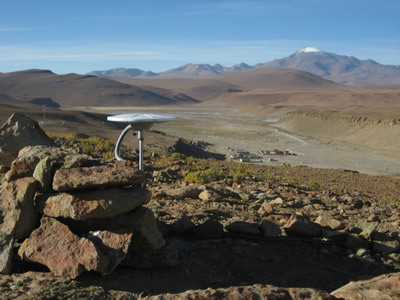 Figure 3 - The view from the central GPS site outside the town of Catena (town is in the background). Winds are very severe on the high plain, thus the small rock wall construction to the left of the GPS antenna. 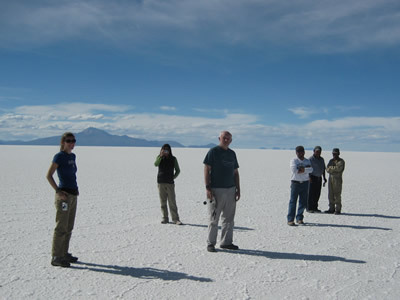 Figure 4 - Members of the seismic field crew pause for a moment on Salar De Uyuni, the world's largest salt flat, located 110 miles north of Uturuncu volcano. Crossing the flat saved time while driving back to LaPaz from the field site.